Castle of Chaos in Branson is one of the most entertaining family-friendly attractions that features the world’s first 5D adventure. 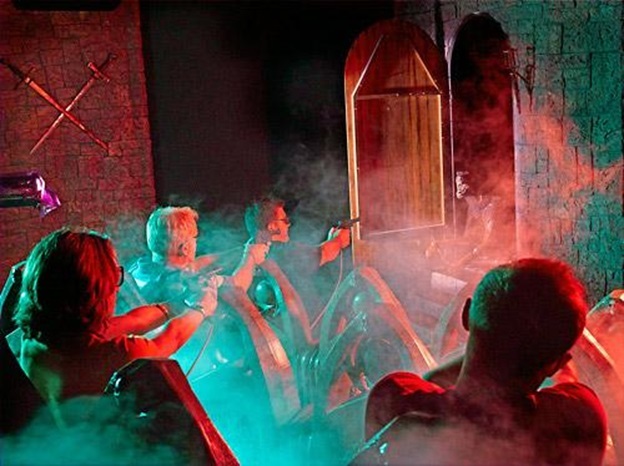 Castle of Chaos 5D Adventure is a unique attraction with locations in Branson, Missouri and Pigeon Forge, Tennessee. This action-packed adventure is shown in a 3D film with special effects, stimulating motion, and an all-out shooting battle against evil. Castle of Chaos has been recognized by the International Association of Amusement Parks and Attractions as one of the best family attractions in Branson. Get to discover the mysteries and solve the puzzles that surround it. This 5D Adventure at the Castle of Chaos is an interactive shooting game that combines the elements of 3D film to create a fascinating adventure ride that anyone hasn’t probably experienced before. This one-of-a-kind 5D Adventure is a new approach to creating unique attraction that combines a scientific perspective with the latest technologies and artistic talents. If you like to get rid of paranormal activity with eagerness to play challenging game, this maybe the video game you are looking for. This challenging 5D Adventure in Castle of Chaos is about Carli Winepeg, a glamorous film star in the 1930s who disappeared in the castle long time ago along with the entire cast and crew of the film. Only a few of spare objects and reels of tape were left behind. As player of this challenging game, you need to discover what had happened to Carli and her crew. And as you start to discover and solve the puzzles that surround the mystery, you need to defend yourself against the forces of evil. Your adventure begins the moment you fasten your seat belt inside the arena that you have chosen to venture in a haunted Branson castle. Once you are seated, your seat starts to move and will direct you to different screens that surround you and the other “ghost hunters” seated around you. On the screen, you will see a variety of paranormal images that you should destroy to make the castle a safe place. Upon seeing these paranormal images, take your pistol and aim it to the ghosts that try to spook you. For each ghost you annihilate, you will earn points. In this challenging game, you need to hear, see, feel, and smell as these four senses will be used to help you fully focus into this unique form of entertainment. This challenging game will give you an unforgettable chaotic experience that you can brag to your friends. This wonderful attraction at Castle of Chaos in Branson has received great reviews from visitors who have praised its unique style and great graphics presentation. Many of the visitors have also enjoyed the ultimate fun and excitement and they promised to be back at some other time. Whether you’re planning to take a wonderful getaway in Branson or looking for some fun things to do to this popular tourist destination, don’t forget to visit the Castle of Chaos and watch the world’s first 5D attraction.